Figure 4.26. Pulse detonation rocket engine (PDRE). conclusion. The comparison for d between Builder and Heiser & Pratt is rather good, considering that the values for Builder were independently done prior to 1964 using a Second Law approach that minimized the cycle entropy rise. Nevertheless the clear advantage in the lower speed range for the PDE is shown in Figure 4.25. The Humphrey cycle is a cycle that has been used as a surrogate for the pulse detonation cycle to estimate performance. As is shown it provides a good representation of the PDE energy conversion efficiency. The energy conversion efficiencies were converted into Isp values (equation (4.11)) and the PDEs compared with conventional ram-scramjets. The more informative parameter for an acceleration-dominated SSTO application can be obtained from a comparison of effective specific impulse, that is, the acceleration specific impulse using the T-D difference rather than thrust, T, alone. For Ispe estimations the aircraft drag was determined from historical data for the two configurations of interest [Anon., HyFAC, 1970]. 12. Pulse detonation-Rocket (PDR). Figure 4.26 depicts a rocket PDE (or PDRE). The PDRE usually is charged with a near stoichiometric mixture of fuel and oxidizer, and they can be any detonatable fuel and oxidizer. For estimating the performance of launchers, only hydrogen was used as a fuel. The primary advantage of this system is less complexity and weight in the propellant fluid pres-surization systems. The PDR is charged with fuel and oxidizer to generally less than 10 atmospheres. The resulting pressure behind the detonation wave can exceed 1000 atmospheres. The very uniform pressure behind the detonation wave yields a constant thrust pulse. In one of the Research Institutes located outside Beijing, China, and at the Aeronautical Research Laboratory at the University of Texas, Arlington, there are high-performance shock tube wind tunnels driven by a detonation wave tube, rather than the conventional hydrogen/oxygen combustion driver. The result is a very uniform driven pressure, with greater run time. The advantages are that the charge to the driver tube is a few atmospheres rather than the conventional tens to a hundred atmospheres. The detonation wave does the compression and heating rather than a mechanical pump. The PDR is such a device, made flight weight and operating at cyclic rate rather than with single firing. It can be installed in any rocket-powered aircraft or launcher, just as the rocket engine was installed, with the expansion nozzles located at the same place. Pulse detonation rocket Figure 4.27. Integrated PDRE ramjet combined cycle. 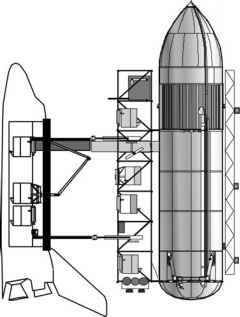 a rocket and ram-scramjet. For the low-speed flight regime, and until there is sufficient kinetic energy to produce a static temperature ratio (C) sufficient to sustain PDE operation, a strut-integrated PDRE is very much as a rocket ejector strut, except with less complexity and high-pressure fluid systems. 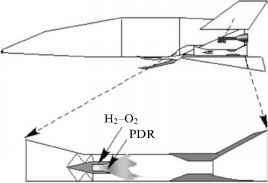 Figure 4.27 shows a Russian concept for a PDRE/ramjet PDE that is equivalent to a rocket-ramjet system and can operate as an airbreathing system up to Mach 6, as described in [Kailasanath, 2002]. In the first operating region, to about Mach 2.3, the engine operates as a pulse detonation rocket ejector ramjet with the PDR replacing the rocket ejector. Above Mach 2.5, the PDR acts as an ejector and is a hydrogen ejector, with a downstream-pulsed oxygen injection which stabilizes an oscillating detonation wave in the engine ahead of the nozzle contraction. So the ramjet nozzle is driven by a detonation wave process. The shock system around the PDR ejector and the ejected hydrogen pressure isolate the detonation process from the inlet, and prevent regurgitation of the shock system. Above Mach 6 the PDR is the propulsion system, analogous to the airbreathing rocket or ejector ramjet-rocket. A representative installation is shown in a hypersonic glider at the top of the figure.